What’s the rest of it? There are really only two areas that I haven’t delved into: Groups and Notes (and keep in mind, FB changes constantly, so these could go away). Groups: a lot more self-explanatory than you might expect. They are, of course, a means for people to gather themselves together. 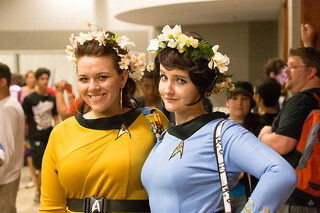 Facebook is enormous and so, instead of looking through several million people to try to find someone who likes, say, Star Trek United, you can hunt for a Star Trek group, join it and, voila! Instant collection of people with an interest similar to your own. Joining in a group affords few obligations. Get invited to a group event? Well, it’s nice to RSVP, but not necessary. New discussion in the group? Well, it’s nice to participate, but you don’t need to. Add photos? Again, lovely, but no one’s holding a gun to your head. Managing a group differs a tad because it’s good to keep it lively. I’ve already talked a bit about groups before in this series, so I won’t repeat what I’ve said. However, mainly you want to keep discussions going (if any) and interest up. Gathering an enormous number of fans (yes, I know they are called Likes now, but what’s the human term? Likers? That just sounds weird, Facebook) helps with that. This helps because it’s a somewhat objective means of showing interest in your group or cause or company, but since there’s a proliferation of dual accounts, that’s not necessarily much of an achievement. Plus, since it’s so easy to toss a Share or Like button on any site, and Liking is so easy, having a lot of fans often just means you got your group in front of a bunch of people who are fine with clicking on a Like button, and nothing more. A group with 1,000 fans is not necessarily going to be easier to monetize than a group with only 100. Notes became yet another means of getting across information. The main difference between them and discussions? The replies seem more like subordinate-appearing comments versus discussion replies. Yeah, it’s a difference without much of a real distinction. The main usage I’ve seen for Notes consists of old-fashioned “getting to know you” kinds of notes. You know, the kind where you’re asked your favorite ice cream flavor or the name of your childhood pet. I’ve been on the Internet for over a decade and a half and, frankly, I think I’ve seen all of these by now. The last bit about Facebook is its very ubiquity. One of the reasons why it is so successful is because it’s, well, so successful. E. g., a long time ago, it hit a tipping point and started to become famous for the sake of being famous, and got bigger pretty much just because it was already huge. It is well-known to be a worldwide phenomenon. Mentioning it is so obvious, so simple and so well-known that it practically isn’t product placement to talk about it any more, much like mentioning a telephone in a movie isn’t really product placement to give a profit to Alexander Graham Bell’s descendants. See you online. And, yes, I will friend you if you like.